Osaka – Despite its less-than-stellar reputation in the news, cholesterol is an essential molecule for living things. It serves as the building block for hormones and helps give shape to the membranes that enclose cells and their internal parts (Fig.1). Consequently, many diseases arise from defects in the proper transport of cholesterol. Now, researchers at Osaka University have shed new light on one of the key pathways used to transport cholesterol inside of cells. 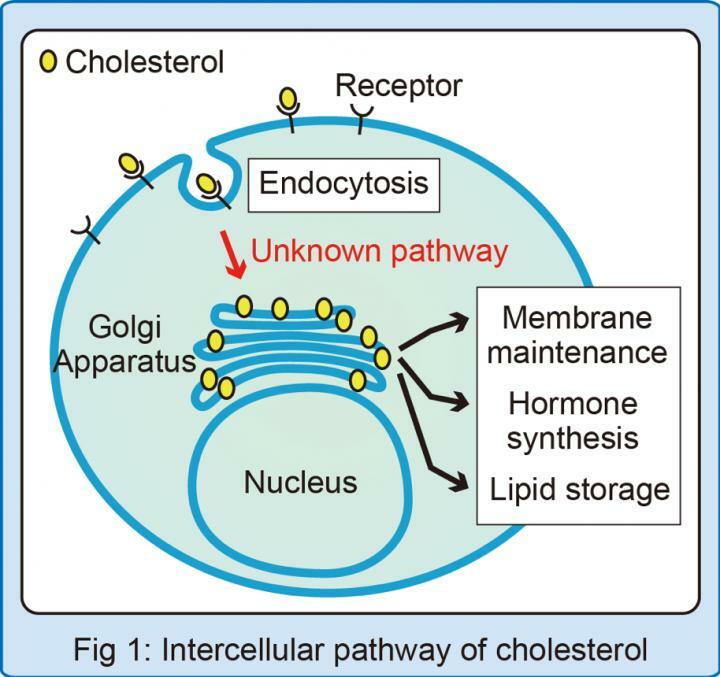 "Intracellular cholesterol transport occurs through two pathways, vesicular and non-vesicular," lead author Tomoaki Sobajima explains. "The vesicular pathway shuttles cholesterol using vesicles that 'pinch off' from, and fuse with, cell membranes. The non-vesicular pathway is just as important to cholesterol transport, but many of the proteins involved still need to be identified for us to understand how exactly the pathway works." The researchers set out to demystify non-vesicular transport using a screening assay, which allowed them to find proteins that interact with known players in the pathway. From this screening, they identified RELCH. Although not previously connected to cholesterol transport, RELCH was found to interact with two critical proteins in the pathway: Rab11 and OSBP. These interactions laid the initial groundwork for the key discovery in the study. "Non-vesicular transport is thought to happen when two membranes tether together, allowing cholesterol to jump from one membrane to the next," Sobajima adds. "We set up an artificial system that lets us measure how well cholesterol moves along tethered cell membranes. What we found was that Rab11-containing membranes (or beads) and OSBP-containing membranes (or beads) tether together very effectively when RELCH is added to the mix (Fig.2), and cholesterol can then move easily across the membranes (Fig.3)." The findings, published in The Journal of Cell Biology, may serve as a jumping-off point for further studies in this newly-uncovered transfer system for cholesterol. "Our study suggests that RELCH is a key linkage protein that allows cholesterol to be transferred across Rab11-containing recycling endosomes to OSBP-containing Golgi membranes," lead investigator Akihiro Harada concludes. "Identifying the Rab11-RELCH-OSBP complex is a major step forward in understanding how non-vesicular transport operates. We believe the findings will eventually help drive the discovery process for treatments of cholesterol-related metabolic disorders involving this unique transport pathway." Osaka University was founded in 1931 as one of the seven imperial universities of Japan and now has expanded to one of Japan's leading comprehensive universities. The University has now embarked on open research revolution from a position as Japan's most innovative university and among the most innovative institutions in the world according to Reuters 2015 Top 100 Innovative Universities and the Nature Index Innovation 2017. The university's ability to innovate from the stage of fundamental research through the creation of useful technology with economic impact stems from its broad disciplinary spectrum. Dinosaurs ended -- and originated -- with a bang!